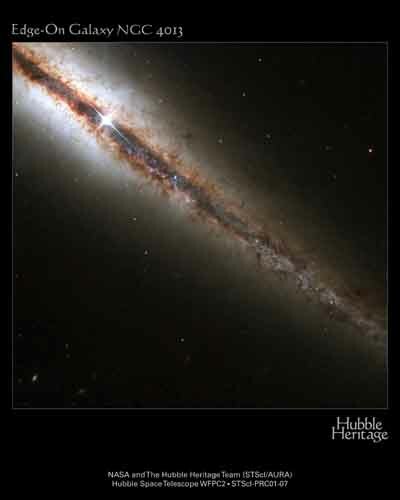 NASA's Hubble Space Telescope has snapped this remarkable view of a perfectly "edge-on" galaxy, NGC 4013. This new Hubble picture reveals with exquisite detail huge clouds of dust and gas extending along, as well as far above, the galaxy's main disk. NGC 4013 is a spiral galaxy, similar to our own Milky Way, lying some 55 million light-years from Earth in the direction of the constellation Ursa Major. Viewed pole-on, it would look like a nearly circular pinwheel, but NGC 4013 happens to be seen edge-on from our vantage point. Even at 55 million light-years, the galaxy is larger than Hubble's field of view, and the image shows only a little more than half of the object, albeit with unprecedented detail. Dark clouds of interstellar dust stand out in the picture because they absorb the light of background stars. Most of the clouds lie in the plane of the galaxy, forming the dark band, about 500 light-years thick, that appears to cut the galaxy in two from upper right to lower left. A similar effect can be seen in our own sky. If one views the Milky Way by going well away from city lights, dust clouds in the disk of our own galaxy appear to split the glowing band of the Milky Way in two. When light passes through a volume containing small particles (for example, molecules in the Earth's atmosphere, or interstellar dust particles in galaxies), it becomes fainter and redder. By studying the color and the amount of light absorbed by these distant clouds in NGC 4013, astronomers can estimate the amount of matter in them. Individual clouds contain as much as one million times the amount of mass in our Sun. Dark interstellar clouds are believed to be where new stars are formed. Later, when the dust disperses, the young stars become visible as clusters of blue stars. NGC 4013 shows several examples of these stellar kindergartens near the center of the image, lying in front of the dark band along the galaxy's equator. The extremely bright star near the upper left corner, however, is merely a nearby foreground star belonging to our own Milky Way, which happens to lie in the line of sight to NGC 4013. This Hubble Heritage picture was constructed from Hubble images taken in January 2000 by Dr. J. Christopher Howk (Johns Hopkins University) and Dr. Blair D. Savage (University of Wisconsin-Madison). Images taken through three different filters have been combined into a color composite, covering the region of the nucleus of the galaxy (behind the bright foreground star at the upper left). Dimensions: The visible portion of the galaxy is 10.7 kpc (35,000 light-years) along its length.